By now, many of you recognize the awesome, high-spirited runners in those flashy, blue and green uniforms as our very own Team HMF. They can be found at nearly every one of our events running, volunteering, pacing and cheering on all of our participants. Just this year we have seen this amazing and inspiring team crossing the finish line and handing out water, and now its time to see them add swimming and biking to their resumes! Many of the team members participate in our multi sport events, such as our Shamrock Duathlon in May and the Litchfield Hills Tri & Du earlier this month. If you missed them don't worry, you will have a chance to say hello to the team at Sunday's Niantic Bay Triathlon or the Women's Triathlon next month. You can learn a little bit about our team members that are Du-ing some great things below! What is your favorite HMF race and why? This is tough! I love the Courthouse O’Putnam 5K because it is a fun, local race but I also love the Hartford Marathon because of the community encouragement along the race course and the challenge of the marathon. What was your single most memorable race day experience? Finishing my first marathon at the Hartford Marathon 2013. I never imagined it was a feat I could ever accomplish until I completed the Hartford Half-Marathon the year before and felt pretty good at the end! What was the lowest moment in a race you experienced? Seeing another runner need medical attention a mile from the finish line of the Hartford Marathon—I felt so bad for them getting so close after all that hard work training. Why do you run? Mostly to burn off the stress of work, but also to stay in shape and for that endorphin rush! What one piece of advice would you give to someone running his or her first race this year? Make a training schedule, stick with it and most importantly have fun with both the training and the race. Train with friends and it will help to keep you all motivated and on schedule! What is your favorite HMF race and why? The 5k Red Dress Run. The camaraderie, comfort and connection of running with all females is incredible. Plus, what better way to support women's heart health? Why do you run? Peace of mind. What is your favorite distance to race? I love them all and for different reasons; 5k's, half marathons, sprint, Olympic and Half Ironman triathlons! What is your favorite HMF race and why? "My two favorites are max's O'Hartford and the Hartford Half Marathon. What was your single most memorable race day experience? I feel like every race becomes a "most memorable." Each time that I cross that finish line and listen to the cheering crowds and see my two girls waiting for me, it's a high! The ability to do something that you love, that is good for you and that emotes a sense of health and well being is a memorable, special experience. I am truly grateful for each and every race, the opportunity to surprise myself! What was the lowest moment in a race you experienced? My lowest moment in a race is when I found myself stopped and walking up a hill. Although it sounds completely understandable, it was a feeling of defeat. I have learned since that you just can't walk; slow jog, shuffle, even a sachet is better than a walk. For both physically and mentally, you lose stamina. Now, I remind myself that it hurts less to run than it does to walk; again, both mentally and physically. What one piece of advice would you give to someone running his or her first race this year? Enjoy every minute of it...you have worked up to this particular moment; this is your victory lap! Look around, smile and wave at spectators and volunteers...run with a bounce in your step and a lightness in your heart. Set a goal for yourself, but don't dwell in disappointment. Instead, relish in the fact that you got out there and did something incredible! What is your favorite HMF race and why? I would have to say the Women's Tri at Winding Trails. I love the feel of the women only race. The variety that come there from first-timers and newbies to seasoned veterans. My second favorite would be Niantic as that was my first triathlon and is a great race. What was your single most memorable race day experience? Completing my first Ironman distance race with my now husband (boyfriend at that time) as we ran the whole marathon together and crossed that finish line with our 2 nieces and 2 nephews. What was the lowest moment in a race you experienced? This is tough as I try to forget those moments when I am at my lowest and just try to be in that moment with putting one foot in front of the other. There were many races where the heat didn't agree with me, I was sick or got stung by a bee of jelly fish but made it through with positive thoughts. What one piece of advice would you give to someone running his or her first race this year? Nothing new on race day. Make sure to have your nutrition tested. What is your favorite HMF race and why? My two favorite HMF races include the Red Dress 5k and the Hartford Marathon. I enjoy the Red Dress 5k because it is exclusively for women, thus allowing us to be more comfortable and confident in our participation. I especially enjoy all of the tutu’s and shirts the participants wear during the race. I really enjoy the Hartford Marathon because of the course and support. At the end of the race, there is a line of water fountains ready for us. I particularly appreciate how HMF went green with the water fountains. What was your single most memorable race day experience? I remember crossing the finish line at the Hartford Full Marathon to qualify for the Boston Marathon. I was using the race as a training run for the NYC Marathon (which ended up getting cancelled due to Hurricane Sandy) and was surprised when I finished the race faster than my race goal! I also PR'd for my marathon race by over 35 minutes. What was the lowest moment in a race you experienced? My lowest race moment was when I ran the Cincinnati Flying Pigs Marathon undertrained. My baby at that time was only 9 months old, but I thought I would be able to train and run a full marathon. I had also never ran past 7 miles in my life prior to starting my training plan, and my longest training run during the place was a half marathon race. The night before the race, I contemplated switching to the half marathon race, but at the last minute decided to go ahead and go for the full marathon. I was doing ok until mile 15 where experienced “the wall.” Long story short, I had to walk and stop several times to complete the marathon after mile 15, but I did it! I’ve learned my lesson & will never run a race under trained. Why do you run? I run because it helps me become stronger and faster both physically and mentally. I love all the health benefits that come with staying fit. I also really enjoy the running community. What one piece of advice would you give to someone running his or her first race this year? My advice would be to be patient with your training and hang on! It might hurt because you might not be used to it, but it gets better. How long have you been running competitively? About four years. What is your favorite HMF race and why? Hands down, the Surftown Half in Misquamicut, RI is my favorite race. I could say it was about the course, flat, great views of the ocean around every turn, lots of cheering fans. Or the time of year, late summer on the shore with crystal clear, cool mornings turning to warm afternoons. The pre and post-race festivities. But the real reason is that Surf Town is my annual homecoming. My family spent summers on the RI shore. Running through Misquamicut Beach and Watch Hill is like running back in time for me. Every step is full of memories. What was your single most memorable race day experience? My most memorable race day experience is from my first half marathon in 2010. I found out that my brother-in-law had registered for the race and having run a few 5Ks, I had been considering moving up to a more challenging distance. About 8 weeks before the race, I decided to register too and start training. Training went well and I set a personal goal of finishing in under 2 hours: a goal that I didn't really share with anyone. Fast forward to race day, my brother-in-law and father-in-law and I set out at a moderate pace. I was feeling great. About mile 9 my brother-in-law starts to slow down (his knee started hurting). I kept my pace and fell in with a small group of runners. As I pass the timer at mile 10 I do some quick math and figure that I might just make my 2-hour goal. As I make the turn into the home stretch (down a long hill) I can see the finish line clock just turn over to 1:59 and I start into an all out sprint. I run past my cheering family - intent on reaching the finish and cross at 1:59:59. Mission accomplished. What's your "Go To" Post race meal? Post race I slam a chocolate protein shake to recover then hit the food tent for whatever is on tap (and by on tap, I mean finding a cold beer). What one piece of advice would you give to someone running his or her first race this year? Soak it all in. A lot of my friends have started running later in life. I tell them that they aren't out to break any records, only set new personal ones. Relax. Enjoy the atmosphere. Meet new people. Run your own race. If you feel good, push your pace. If you don't..save your legs for another day and another race. Enjoy a cold beer at the finish and then look forward to your next race or your next distance. At this point in our lives, we should be running and racing because we love it and doing everything we can to keep that love-affair going. What is your favorite HMF race and why? Niantic Bay Triathlon. It was my first HMF race and the course and community are beautiful. Plus, what's not to love about finishing on the beach in August? What was your single most memorable race day experience? Crossing the finish line of the 2011 Mohawk Hudson marathon with my daughter. She was 4, and ran the final few hundred feet of the race with me. What was the lowest moment in a race you experienced? The 2015 TCS New York City Marathon. I had a nagging injury that flared back up at mile 8, and by mile 10, I was walking. I ended up walking to mile 26, and fought to run across the finish line There was NO way that I was walking across that line! What one piece of advice would you give to someone running his or her first race this year? Enjoy every second of it. Don't get discourage if you need to take a walk break or stop at every water station. You are doing something that may have scared the pants off of you when you signed up. Then, after the race, go find another race to register for. You now have a PR to lower! Register to Run Hartford by July 31 - Get Great Perks! We’re giving you more reasons than ever to register today to Run Hartford on October 10! With perks for everyone who registers by July 31 to run the Eversource Hartford Marathon, Half Marathon or 5K, plus Refer-a-Friend perks for those already registered – now’s the time! Get ahead of the pack. And get some perks. Register here by July 31st and we’ll send you a free car magnet and give you $10 off our PrePerks race-day experience – with personalized bib, Mail My Packet, heated indoor pre-race space and personal baggage check. You’ll also have a chance to win prizes everyday, from free entry to #runHartford training shirts or running gear. Through next week, join HMF Events on Facebook for contests with unique prizes, including the chance to win the Race Director’s parking spot and pairs of Skechers shoes. Participate in our #runHartford hashtag contest on Twitter @runHMF to win daily prizes, with opportunity to win free race entry. Follow us on Instagram @HMF­_Events to share photos of you in Hartford Marathon gear to win #runHartford training shirts. Refer a Friend and Get Good Stuff Too! 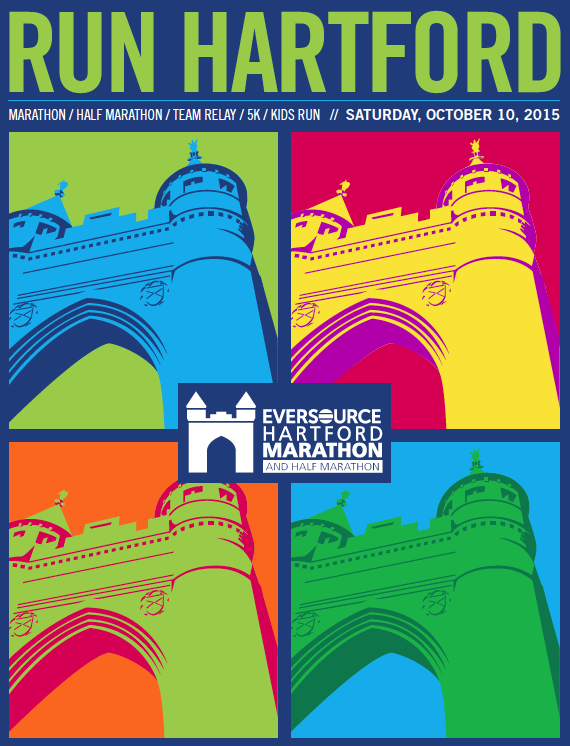 · Refer a friend to register now for the Eversource Hartford Half Marathon and Half Marathon and get a FREE race car magnet. · Refer three friends to register and get a FREE #runHartford training shirt ($20 value). · Refer five friends to register and get FREE PrePerks pre-race experience ($65 value), including personalized bib, Mail My Packet, heated indoor pre-race space and personal baggage check. When your friend registers by July 31, they simply enter your name into the “Referred By” field in Chronotrack. They will also get a FREE race car magnet and $10 off PrePerks and be automatically entered for chances to win cool stuff. For more details on the Eversource Hartford Marathon or to register, visit www.hartfordmarathon.com. Thoroughly planning ahead is pivotal to race management of HMF Events – that means we plan for the expected but also prepare for the unexpected, as much as possible. Weather is often the culprit behind race-day course change decisions, which fortunately are pretty rare. 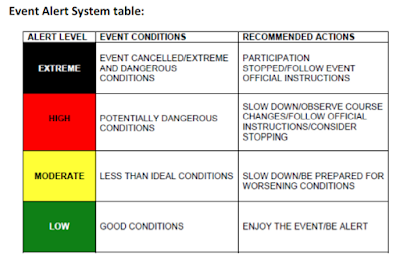 Since 2013, we’ve used a color-coded Event Alert System to communicate with participants about the impact of weather on race day. This colored flag alert system is more than simply communicating the temperature, we calculate what’s called Wet Globe Bulb Temperature (WBGT). Sounds fancy, right? It’s far more accurate than temperature (the reading on a thermometer provides ambient temperature, like you hear in the weather report). nly ambient temperature, but also relative humidity, solar radiation (the “sun on a black car hood” thing) and the cooling effect of any wind that might be occurring. So, the WBGT Index can be quite a bit different from the ambient temperature reading you hear or see. Sunday was hot and humid, so we were regularly checking WGBT at the Litchfield Hills Olympic Triathlon. Before the race, conditions were moderate, or “Less Than Ideal”, marked by the Yellow flag with suggestion that participants slow down and be prepared for worsening conditions. When participants were out on the bike course, new calculations indicated the high alert “Potentially Dangerous” Red flag conditions. Within 5 minutes of the reading and before the lead bike came into transition, we made the decision to change the planned 10K run route to a 5K. Utilizing a back-up plan to follow the first run course of the Duathlon, we re-routed runners to include paths through shaded areas in the woods. Overwhelmingly, participants were appreciative that we put the consideration for their safety first. For anyone that was upset about it, we’d rather have you a little irked and walking out on your own than chance what the alternative could be. As race organizers, our primary goal each and every event is to have every single one of our participants make it to the finish line upright and smiling. Whether you earned a personal best or even had a bad day, that’s all secondary to your safety and being able to brag about your medal (and complain about your aching muscles) the next day. We've introduced a new perk to help encourage you at this Saturday's Red Dress Run for Women, presented by UnitedHealthcare. Pace teams are a group who run together led by an experienced leader - the pace leader runs a steady pace and keeps track of that pace so that the group can achieve their goal of finishing at a specific time. This is a free service for any registered runner. Thanks to Team HMF for volunteering to pace, meet the pacers here! What is your favorite HMF race and why? Surftown. While I love the crowds, energy and big race feel that Hartford has to offer...I just love the course at Surftown. It is absolutely beautiful and is at the right time of year. Early fall so it is not to cold and not to hot.... just the way I like it. I also love all the post race fun! This year I stepped out of my comfort zone and ran the O'series and had a blast!!! I age group placed at O'Niantic and O'Hartford. I had so much fun running this series that I decided to once again step out of my zone and run the Scramble Series...I will keep you posted if I have a new favorite. How long have you been running competitively? about 7 years now. What is your favorite HMF race and why? My favorite HMF race was actually the CTfastrak 15K this last May. The energy that day was just so exhilarating from the other participants. The course was the perfect length and everyone was so positive about the experience when it was finished. I think too the day was just that perfect Spring day where as a runner you are reminded why you like running so much. I carried that race day with me for a month. Why do you run? I run because running gives me the power to feel like I can take on anything life hands me. It clears my mind, helps me to love my body, shows me so many parts of the world that I would never discover just moving through life. I have run in Paris, London, Rome, Brazil, Mexico, California, Arizona and so many other beautiful places. I run because I remember as a little girl my Mom ran when women really didn't. I run because it has given my daughter Elanna and I a bond that will last forever. I run because I am now part of a team that continues to motivate me to run the next race. I run because I love too. How long have you been running competitively? A little over a year! My first race was May, 2014! What is your favorite HMF race and why? Not only is it my favorite HMF race, but it is my favorite race altogether: Shamrock 3.3. It was my first race ever in May 2014 and I hope to do it every year to mark my progress. And maybe one day, I will be brave enough to do the whole duathalon. MAYBE!! What was your single most memorable race day experience? When I completed my first race and placed in my age group. I didn't even know there were "awards" given at races or anything so it was a cool surprise. The whole thing was an experience I didn't expect with tents and vendors and a post race beer! Why do you run? I run to see what my body can accomplish. I am amazed that in April 2014 I literally couldn't run 1 mile and I've completed 3 half marathons and many races of other distances since then. What one piece of advice would you give to someone running his or her first race? RUN YOUR OWN RACE! By that, I mean, don't worry about who is passing you, who is front of you, and who is behind you. Just run what you can run and enjoy the finish! What is your favorite HMF race and why? Surftown because of the beautiful course! What was your single most memorable race day experience? My most memorable race day experience was breaking the course record at the Amica Iron Horse 5K race this year! What's your "Go to" pre race meal? I always eat Wagon Wheel pasta the night before and a half of a chocolate glazed doughnut in the morning for race day fuel! What's your "Go To" Post race meal? My favorite post run meal is always grilled cheese!! Why do you run? I run because exhausting myself on a run is one of the most relaxing and satisfying parts of my day. What one piece of advice would you give to someone running his or her first race this year? You may feel miserable during the race, but the feeling of crossing your first finish line is like no other feeling. Cherish that moment. What was your single most memorable race day experience? There are so many memorable race day experiences! From being a course monitor volunteer and having so many runners thank me for being there and giving me high fives to placing second overall female in a 5K. But I’ll share a more recent one, in which I ran the longest race to date, the CTfastrak 15K (May 3, 2015). I saw so many friends and fellow runners, who cheered for me, encouraged me, ran with me and then at the end, so many who told me they used me as a “pacer” to keep them going. This was the first race that I had friends waiting to cheer me on. At the end, not only was I so grateful that I had completed this distance, but imagine my surprise when bibbed strangers who I didn’t and couldn’t see thanked me for simply running (my race which allowed them to run theirs)! Why do you run? I run to feel capable, fit and strong and to spend time challenging myself to do something that last year felt labored and the year before seemed implausible. What one piece of advice would you give to someone running his or her first race this year? Ask questions, get a plan, follow it as best you can, start slow, cross-train to stay healthy and cut yourself some slack along the way as you listen to your body. Keep a running/fitness journal as you enjoy the journey as you will discover it's not all about the end goal of running the race. Along the way, you will make countless friends, learn countless things about running, nutrition, your body and your capabilities. But most importantly when you reflect, you'll be thrilled about your accomplishment(s) and your successes along your journey to and on race day! What is your favorite distance to race? I love the challenge of a half marathon but take more enjoyment in a good 10K, it's that perfect distance to challenge yourself but you can run it everyday! What is your favorite HMF race and why? Amica Iron Horse! It is right in my hometown!! It's great being so close to home and running the race in my favorite community! What was your single most memorable race day experience? The Iron Horse half this year, I ran it with pneumonia! Why do you run? I run to stay active and healthy, as a way to spend time with my mom. What one piece of advice would you give to someone running his or her first race this year? Never doubt yourself, for years I never thought I would run, than one day I just went out and put one foot in front of the other and I haven't stopped since! What is your favorite HMF race and why? The O races – O’Putnam, O’Niantic, and O’Hartford. The O races are my current favorite HMF races because in 2015 I ran all 3 races with my 8-year old son. To share those miles, finish lines and accomplishments with him was pure joy. What was your single most memorable race day experience? Running the Harvard Pilgrim Middletown Half Marathon with my coach (Olympian, Jeff Galloway). Why do you run? I run to keep my mind and body healthy. What one piece of advice would you give to someone running his or her first race? You can do anything you want to do. What is your favorite HMF race and why? Surftown Half…so beautiful, perfect weather … jumping in the ocean! What one piece of advice would you give to someone running his or her first race this year? Run with joy! Smile!